If you don’t want to get the flu (and who does? ), you need to take steps to prevent it. Your best line of defense against this nasty bug is the flu shot. Here are seven facts you should know. We all know someone who says she doesn't get the flu shot because the last time she did, she got flu. That doesn't happen, according to the Centers for Disease Control and Prevention. The shot does contain the actual flu virus, but those viruses are killed during the manufacturing process -- meaning it just can't give you the flu. The vaccine is double-checked to make sure no live virus survives. "Batches of flu vaccine are tested to make sure they are safe," say representatives from the CDC. Flu season usually begins in October or early November and runs through the winter, sometimes into spring. You have the biggest advantage if you get the shot near the start of the season so you're covered the entire time the virus is on the prowl. If you miss it early on, however, you should still try to get the shot while you can. Even if you get it late, at least you'll be covered through the rest of the season. Everyone who wants to avoid getting the flu should talk with her doctor about getting the flu shot, but some people are at a higher risk for developing complications from the flu; for them, the shot is especially important. Those at a higher risk include those over 50, children between 6 months and 18 years, anyone who is pregnant or caring for an infant during flu season, and anyone with a weakened immune system, according to the CDC. Although you won't get the flu from the flu shot, you may experience some unpleasant side effects. You'll probably be sore for a few days in the spot where you got the shot. This is both from the shot itself and the antibodies hard at work under the skin. In rare cases, patients have reported fever, weakness and muscle aches, according to the Advisory Committee on Immunization Practices. Consult your doctor if the symptoms last more than a day or two. Unfortunately, the flu shot doesn't make you immune the second you get it. Your body takes about two weeks to build up immunity to the virus after the vaccine is administered, according to the CDC. Be aware that you're still susceptible for that time period and try to avoid exposure. Those who don't like needles have alternatives. FluMist is a nasal spray vaccine that also helps your body build flu immunity, but in a very different way. Unlike the shot, the nasal spray uses live flu viruses, although they are weakened and should not be strong enough to cause the flu. For this reason, anyone with a weakened immune system should avoid the nasal spray vaccine. 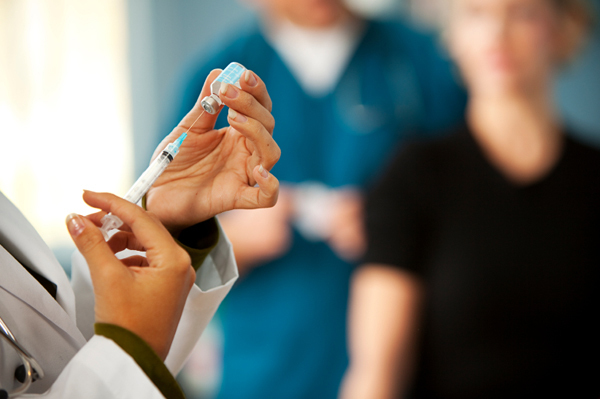 If you choose this route for vaccination, you may expect some unpleasant side effects, including runny nose, nasal congestion, cough, sore throat, chills or weakness. This may sound like the same effects that come with the flu, but those that accompany the shot are much milder and last for a shorter time, according to the CDC. Getting the flu shot exponentially reduces your chances of contracting the flu virus, but it doesn't make you completely immune. You can contract the flu even if you have been vaccinated, especially if you have a weakened immune system. According to the CDC, those who receive the vaccination and still wind up with the flu generally experience milder cases with less serious complications.